You know the sound of a sitar. My wife, Joy, says, "Oh, yeah, that's the instrument that snores!" In any case, the sitar gets that special buzzing sound from the bridge. The strings flap against a broad flat plate so they rattle and vibrate to provide just the right amount buzzing sound. 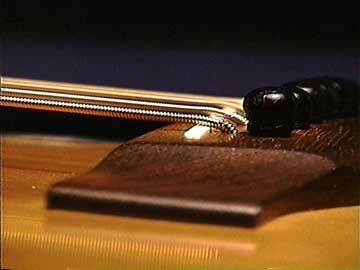 Guitar saddles can work just like little sitar bridges. The string comes up out of the bridge and goes flat across a flat saddle. When the string vibrates, it flaps against the saddle, with a characteristic buzzing sitar tone. An easy fix: Make the saddle rounded on top so the string will contact a single point and not be able to flap.